A summer safari in Manitoba's North is the experience of a lifetime. Make that two lifetimes. You can see both great white icons - polar bears and beluga whales - and soak up the diverse culture of this vast natural landscape at the same time. Go off-the-charts wild with a rugged adventure trek, soak up a little luxury at a remote lodge or tread the middle ground with a safari that can be adjusted to your comfort level. Make your trip to Manitoba's coast your very own. Whether it's a one day adventure, or you choose to go all out on a week long safari is for you to decide. 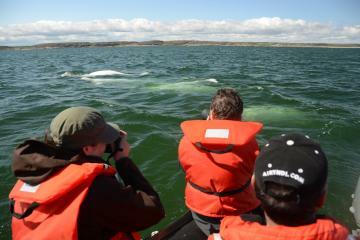 Polar bear and beluga viewing excursions are available from local outfitters for all levels of adventure seekers. 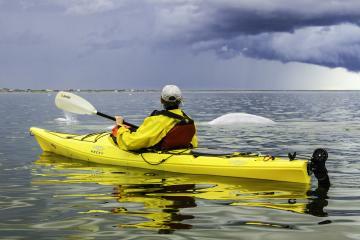 Hike through the sub-Arctic tundra to see polar bears and other local wildlife, take a kayak or one of the tour boats out onto the Churchill River and experience the rush of having hundreds of friendly, curious beluga whales surround your boat to say hello. After your adventures on the tundra, be sure to explore the town of Churchill; take in the creativity of the beautiful Sea Walls murals throughout the area, enjoy exclusive dining opportunities, and enjoy the hospitality of this quaint Northern town.